Purchase a ticket toTake the test! What's included in this IQ test? 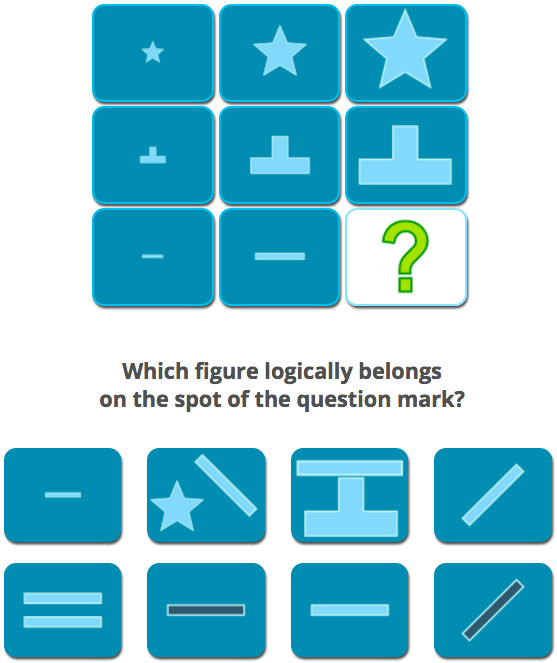 This IQ test uses one type of question with which your intelligence is assessed. Each question consists of a 3 by 3 matrix, with a question mark in one of the cells. Your job is to to identify the missing element that completes a pattern of shapes by picking the correct element out of 8 options. The test consists of 25 questions which become more difficult along the way, based on the answers you've given. Buy a ticket and take the culture fair intelligence test now. What does 'culture fair' mean? This nonverbal intelligence test is culture fair because it avoids cultural and language biases and focuses on logical reasoning only. The test is based on the highly scientifically validated progressive matrices test of dr. John Raven. Scoring 124 or higher on the culture fair intelligence test will grant you permission to sign up for the International High IQ Society. Only 5% of the people in the world have an IQ of 124 or higher! A great way to measure my intelligence with international norms. Want to try a demo first? If you are interested in taking a professional culture fair IQ test but want to try a demo first, visit our free IQ test page and select the culture fair intelligence test. If you would like to try a different type of IQ test, including questions regarding verbal, numerical, logical and spatial reasoning, please select the free classical intelligence test.